Neymar and his team mates put in an inspiring display leading Barcelona to 5-1 La Liga win at Leganes on Saturday. The Catalans were keen to avoid any upsets similar to their 2-1 home loss to Alaves last week and Coach Luiz Enrique put out the strongest starting XI at his disposal. His decision to field the best paid off as Barcelona dominated from start to finish – Messi opening the floodgates in the 15th minute before Luiz Suarez and Neymar rounded up the game. Neymar put the result beyond question right before the break with a 44th minute strike past Serantes. The outcome of the game might have impressed many in La Liga, but former Nou Camp star, Michael Laudrup was not happy with Neymar’s ‘ Showboating’. Laudrup, a key member of Johan Cruyff’s Barca ‘Dream Team’ between 1989 and 1994. Yet following his commentary on BeIN, the Dane left many with the same feelings as to when he departed the club for archrivals Real Madrid in 1994, offering limited praise to Luis Enrique’s men. 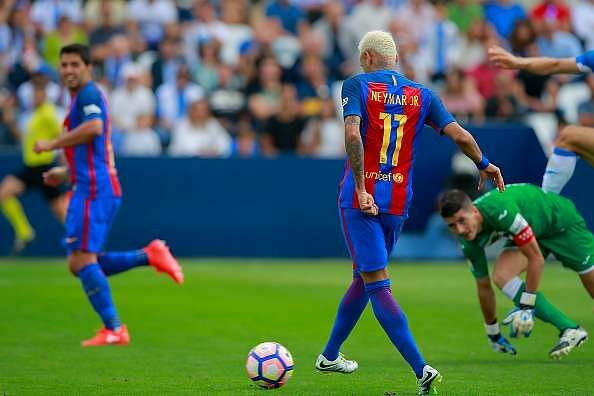 The former Swansea City coach accused Neymar of inciting the Leganes players to react once Barcelona were 4-0 up. Neymar, marking his return from the summer Olympics with his first La Liga goal of the season, won a penalty and clearly antagonized his opponents with his ability to escape their clutches with the ball at his feet. Neymar missed the start of the campaign after representing Brazil in the Olympics. Since his return, he has scored twice and provided five assists in three appearances. Laudrup has been out of management since leaving Qatari side, Lekhwiya having guided them to a league and cup double.